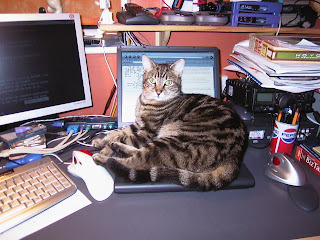 Turned around for 10 minutes at home and the cat (PUD) decided to sit on the laptop. A huge pile of qsl cards turned up this morning, 49 for the 3B8/M1KTA trip in March 2008, that has to be almost the fastest turn around of qsl cards yet. 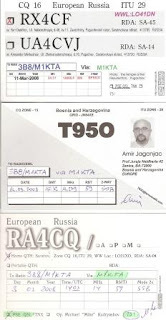 I did also get one from my EU011 IOTA trip back in 2005 so qsl via buro can be much slower. I never checked the logs as most are paper but from qsl cards my HB9/M1KTA confirmed DXCC count is now 28. 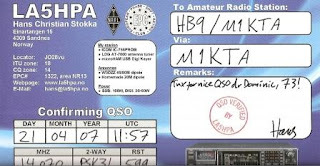 HB0/M1KTA has 23 and 3B8/M1KTA, which was electronic is at 31 so far out of 58. No DXCC awards for those trips yet! Whilst in HB9 2007 I built this little interface for my iPAQ so I could control my FT817 using bluetooth. I will upload details of it in another post. The iPAQ could also operate psk as well. The little box to the left of the rig is my power distribution block with 4 sets of twin 4mm connection terminals, plug and screw. This is a standard part of my /P setup. The battery I bought in JUMBO a sort of Swiss version of Home Depot or B&Q and powered the radio on all non-bicycle trips in HB9 during 2007. Flying back to UK The battery flagged a security alert packed in baggage. I was formally asked not to fly with a battery again by the airline! In the back ground you can see a superdrug radio. These photos were staged in my apartment some time after I built and setup these interfaces. I know this as there is no antenna on the radio just a dummy load and the log page was from 21/4/2007 not 7/6/2007 as the photo date/time stamp shows. where they had a 3 el yagi for me to play with which made qrp operating so much fun. I have been asked in letter sent along with a recent qsl card to show any images of psk operating from 3B8 so here are a few images. I operated from 3B8CF shack and he uses an Alpha linear and an ICOM rig which we left in place and you can see them in the images. I operated an FT817 (PSK and CW) and FT897 (SSB). The images are small initially but if you click on them they should open full size. I used HRD psk31 (not DM780) and set up the software to operate a beacon as in this image. The key to operating psk pile ups was the ft817 I used was setup with 500Hz filters on ssb (operating 20m mostly for psk) and I would between the beacon sending scan the RX frequency (what ever you do don't touch either the software or the TX frequency). The FT817 would be operating split so the tx freq was locked but I could manually tune the RX. As I scanned I would note the callsigns and approximate freq up or down of the stations answering the small pileups. I was nearly always listening up from the TX freq, which I usually set to an odd frequency just above the start of the PSK freq window. Sometimes I would operate the 20m psk station in beacon mode for a while, if there was no response, or waiting for propogation to change whilst I was operating ssb on another frequency (I did this on 17m a couple of times). Then I would respond as I have just done in this case with RG3K. As you can see sometimes the exchanges are very brief and subject to interference. Once spotted in the DX clusters (just added to the pain of others trying to contact me?) I didn't need to send the beacon and the qso were almost constant one after another. When you are the DX station it is interesting to note who calls you as propogation changes but it is so very important to maintain a regular pattern to your psk operating otherwise you will have huge amounts of qrm. I would advise make sure stations don't send you lots of information and ask in any cq for short qso like contests only. The other stations trying to contact you will appreciate it. In this case the RG3K station was in a contest already. I made electronic logs of all the psk operating and double checked my qso logs afterwards. psk from 3B8 was an enormously successful mode qrp. Forgot I joined....I am member M1KTA-1457. Another post about previous activity. The operating location (a bench next to a ski trail) and close up of the station, FT817, Z11, Heil boom mic and car emergency battery (17AH). Antenna 12m fishing pole and 20m dipole with RG58 coax feeder. 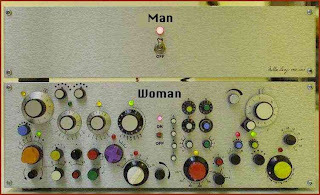 Really doesn't get much simpler. Note the water, hat and sun block. 2 days in the sun at altitude can be hell otherwise. Not exactly roughing it. This is the resort of Malburn, high up in mountains in HB0, although most snow has melted until the sun hits you it is well below freezing. HB0 is not rare but might be of interest to some especially QRP and as I was only a few hours away in Zurich I operated under the CEPT rules as HB0/M1KTA/P from Liechtenstein. I planned to be on a big hill over looking Vaduz (15th April) Sunday or (16th) Monday. Liechtenstein is about 1 1/2 hours away by train from Zurich where I am working. I emailed ARCI, GQRP and a few others lists just in case. My location will be near Treisenberg. possible but down to propagation really I suspect I will be on 30m or 20m mostly. 16 Monday 0100-0300 Run for the Bacon? But Sunday PM and Monday look pretty clear of contests. I went QRT at 10:59 GMT 16/04/2007 after the batteries gave out after total of c11 hours operation over two days. Thanks to everyone that replied to the CQ's the ratio of qso from CQ calls to tail ending was 70:30. A nice mix of QRP and QRO stations. Travel from Zurich to HB0 qth 2 hours total! Anyway up and running almost immediately after arriving in Malburn. Not expected to be a UK affair but the first call in the log on 15/4 was QRP station G1INK andthe last on 16/4 was MM0TFU running QRO, a respectable number of qso in between. I will QSL through RSGB buro. I first spent a bit of time listening to the bands and then decided to go with 20m SSB as I expected and put up a light weight 20m dipole made for the w/e. Selecting 20m paid for itself as after only being onthe air for 20 minutes called CQ just 3 times and first response was Steve G1INK who was activating SOTA Kinder scout SP001 running QRP also just 4W My report was 53-57 QSB so was happy enough. The 20m band was very alive and the next series of contacts were all from mid UK. Nigel 2E0NHM sounds like you have a very good antenna. No surprise, respondingto UK CQ's was not successful but I had success the other way around. Almost everyone commented that QSB did make my signal unreadable at times. The band skip lengthened just as the shadows shortened and it started to get very hot on the hill (most odd, as snow underfoot and 26 degrees, I was at 2,000m, well above Vaduz or Triesenberg on a hillabove the resort of Malburn in the end). Stations from the US started to appear in the log along with Russian and Eastern Europeans, mostly working each other with some opportunistic tail ending. The HB0 call helped? I am hoping for a couple of K1, KC4, and a bunch of RW and RA stations. I heard some W1's but no response. KK3OQ was in QSO with Brian MM3YIO both very strong, then KK3OQ worked MM3XXW, I am hoping my KK3OQ exchange was OK as he said I was barely readable however neither M3 station stayed on frequency or nearby. CT1EHI, thanks Marco for preserving to get the whole of what must have been a very confusing call sign. Forced QRT at 17:00 GMT to recharge battery. Could not return as no lights in area so at sunset could not operate safely and operation not permitted at the guest house (TURNA). 16/4 started earlier today and this time lower down although wasn't prepared for the start to be as cold as it was and put on almost everything I had, Malburn is above the snow line this time of year and effect of the sun was not felt for another hour yet as the ridge line above me meant contact with the sun was not until nearly 09:30 GMT but it was well worth the early start at 07:00 GMT with an 80m dipole this time. I heard (but could not work any alas) plenty of UK stations on 80m and VK stations on 40m and it was good to listen to Tony F5VBY (ex-G3TZH) who was taking his pick of them from 40 miles NW of Toulouse. So if you want to work VK stations UK guys 40m early morning c07:00 has them loud and clear. Finally worked Tony F5VBY at 08:47 GMT as the VK stations went away, we had had a brief contact an hour earlier but as we realised I was at the back/to one side of his beam as he was working long path to VK/ZL only when he turned to HB0 was the contact possible. Note my dipole was E-W so 'directing' N-S. He has a 2el yagi and 450W and his comment was "you like making life difficult for yourself" as I was 5W to a 80m dipole at 9m (using z11 to bring in 40m). I suspect a better 40m setup would have brought good results and maybe 10W for 80m? Most activity on 40m then seemed to be German nets so went QRT and had breakfast. I then switched back to the 20m dipole again at 09:30 GMT and waited for the skip to improve. Stumbled into a group on 14.236 Idris GW3TLP, Nick from Moscow RW3DUG, Frank OA0NFJ and although they were ananalogue SSTV group were happy to say hello to a qrp /p station. Idris had a 6 el beam. Report given was 58, it must have been their ears. A05AT Special Event station (EA5AT home call) Fernando from Valencia.CN8YE From CasablancaSV1JGX who said I really did have an S8 signal and the hight must have had an effect. The last call was Ian MM0TFU who said there was QSB on my signal. I did try cw at the bottom of every hour but with 0% success. Maybe it is my cw is too slow or the cw call sign was too long? If anyone has any hints I would be glad to hear them. All in all great fun and would recommend /P operating in the alps to anyone but bring something very warm for the early start and sun block and a good hat for the sun at midday. Back at Zurich QTH and I looked and HB0/M1KTA/P appeared in DX cluster spots a couple of times. I will QSL all contacts. Post brought another pile of QSL cards this morning. As per usual mostly for M1KTA. However a collection for recent activity as HB9/M1KTA/P (bicycle), 3B8/M1KTA and some IOTA & SOTA activity. Note it is important to make sure the other OP knows to send QSL via your home call and these cards are addressed correctly. This works as there are perhaps 2 dozen cards representing many different countries. Clive (M5CHH), Dom (M1KTA) looking on with Ron (G3KBR) at the mic. As we sit in the colder part of the year the mind remembers warmer times and previous activities. This is a few years old (2004) but I record it here. 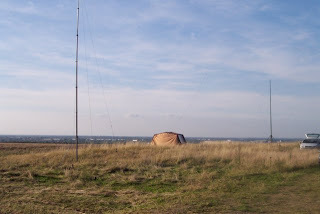 I used to be a member of the Cambridge and District ARC and as I have an interest operating HF and /P I used to organise the IARU Region 1 SSB Field Day station for the club. This was less than 18 months after I first obtained my original novice M3KTA and full M1KTA callsigns. Now I would consider our QSO count from that w/e tiny compared to recent operating but it was so much fun. Unfortunately CDARC interest in HF activity seems to have all but disappeared in recent years and I ceased being a member some time back. We had panoramic views of Cambridge and surrounding countryside as we operated from the VHF FD site (or rather across the road). The farmer had not yet mown the grass and initially the tent has grass above the chair arms! Information provided by Dominic M1KTA.... as per the CDARC website. Thanks to everyone for all the hard work. Especial thanks to Ian Alexander for obtaining a Deisel generator for our use. The generator ran non-stop (except when station went QRT during the night for 3 hours) and consumed a trivial amount of fuel. Operating the station at 100W at night with a couple of 60W 240v lamps and even a kettle (just once!) we saw no reduction in supply during the contest. The generator had excellent regulation. We ended up with some pretty reasonable DX in the end and some good multipliers would have resulted even if the total QSO count was not terribly impressive. Some DX was US, Canada, Brasil, Israel, China, Thailand, Japan. The station was operating SSB only and within the restricted section of the IARU Region 1 SSB contest which meant that we could use a single tranceiver at 100W to the antenna feeder with a single antenna with no part of the antenna or its supports (max 2 permitted) at a hight greater than 50 feet above ground level. 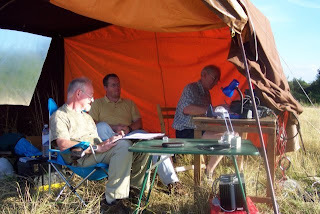 We setup across the road from the main VHF station as we shared the weekend with the club 2m trophy competition entry and David suggested we run the stations separated so we would not interfere with each other and to give us more room to experiment with aerial layouts. Anyway, what a view.... see the photo. At night the sky was clear and Dom (M1KTA) even took a break from operating to so some astronomy. We used two pump up masts with an approxiamnte height of 30 feet. It was decided to place the two masts, Dom's (M1KTA) Racal pump up and the Club Hilo pump up approximately in a North South direction and strung two halliards from the masts. We provided support for good back tension on both masts as we pulled up the wire antennas and attempted to keep them horizontal. The station was up and running 2 hours before the contest using the club rig and ATU although we had considerable difficulty trying to get the club ATU to find a match to the 135ft Sigma antenna. In the end 30 minutes before the off we pulled the antenna down and put up the club G5RV. The difference was notable and this combination was used for the first day. The station was not well manned with operators during the evening and by 9pm at night only Dominic remained on site. As Dominic manned the station alone during the night the station went QRT shortly after about 1:00am. Mike & Mark (M0BLP, M1MPW) looked in at about 2:30am to check all was well to find Dom asleep on the station floor! At about 3:30am after waking up I switched to an FT897 and put up a new antenna tested the previous weekend, an OCFD and with the DSP capabilities we were able to work some stations in the US though apart from K5ZD none were interested in exchanging RS + serial number. In error (M1KTA i.e. me!) didn't realise that if a station was not taking part in the contest the QSO could still be counted as a serial number of 001 could have been given to that station. It had been a long solo night and a silly error really. The station had sufficient operators especially on the Saturday afternoon but it probably suffered contest wise by not operating right through the night. The serial numbers of stations worked on the previous Sat PM were noticeably greater when heard QSO on the Sunday AM. Contact with one or two confirmed that the period betwen 2am and 4am had indeed ben very busy on 20m and 15m. Clive (M5CHH) brought all manner of comfort to the station with an open air cooked breakfast with Dom and Christine (M1KTA XYL) at 5AM. Interestingly the contest was being run at the same time as an all asia contest and many QSO on 20m especially were aborted due to ststions not wishing to complete a contact a GB station. The G2XV/P call did seem to make a lot of difference in Europe and the UK and much interest in the station call occured on the Saturday PM. The station was given good signal reports into the continental US and the small number of QSO with north America was not indicative of the bands as they were alive with Americans near midnight. Notably and perhaps most dissappointing there were no M3 stations worked or heard throughout the whole weekend. We tried to obtain an internet connection through the University Engineering Labs again as we had done during the July VHF NFD when M1KTA operated the 70cm entry of the CDARC B Station. This time we used a Vertically polarised YAGI instead of a homebrew Helical. The increased gain (24dB) as opposed to the lesser gain of the homebrew antenna (15dB) and the correct polarisation allowed a good connection with the lab to be obtained. A distance of probably 3 miles. The connection was running at c11MB/s which was perfectly respectable and would have been useful for DX cluster, chat and echolink, which is why we reattempted the connection after the july failures, however, the network routing had not been configured for us correctly at the lab end so we were not able to create an internet connection. The attempt has proven though that the site can provide a good line-of-sight internet connection over several miles. The equipment used at the station end consisted of a D-Link DWL-2000AP+ access point capable of running at 54MBps connected to a Sony Vaio laptop and a D-Link 24dB external antenna. Nearly all our club members and many visitors attended during the weekend to add support for the effort. Better luck on all counts next year. I attach the log for our entry. X-SUMMARY: is correct and true to the best of my knowledge. XYL sent me this, I thought it was funny. Just won flea bay auction for 5 type 23 stepper motors. 2 more than need so will use them for an alt-az controller. Figuring out the controller now as these are bipolar motors. Seems the most likely candidate with some pass transistors to sink > 1.0 amp on the outputs. Thought it might be fun to make one of these after seeing the 'instructable' here for it. Might not mill PCB with it but Christine's(XYL) Dad would be interested in the wood working possibilities. Well I have decided to build one after a lot if discussion. The tank is a 2.5 litre small food container which is tall and flat and thin with a removable lid. I have placed a 50w salt water aquarium heater in it that will warm water adjustably to nearly 40 degrees from the cold tap in less than 10 minutes, which should be fine as I intend using freshly made etch which will be pretty warm to start with, or pre-heated by placing the tank next to a radiator in the study. I have a small aquarium aerator and an air stone, that will provide the bubbles. If needed I will add a circulation pump. A small thermocouple and LCD readout (+5V) from a PC will allow me to monitor temperature. To reduce the volume in the tank I will use a sealed 'hippo' made from thick plastic wrapped around a piece of wood and then heat sealed. A count up and cout down timer will be added to the assembly. PCB will be suspended from the lid. Was sent an email asking about the shack. It is not the tidiest it has ever been. Sometimes the main desk surface is almost clean, especially the homebrew bench as the shack has been used for contests with two stations running in it, one using the homebrew bench. The operating postion, FT897, FT817 (just in picture on bottom right) sitting on a Z11 ATU/AMU. Shelf above holds MFJ993 ATU/AMU, Norcal Power Meter,Just to the left is a 1KW dummy load. The draws above contain all the patch and interface cables. Stations operated often with PC control and there are two behind the monitor, one below (Running Windows XP and Linux) with a WiFi link to the house. Sometimes I have even attended rallies carrying a couple of these so I have almost pre sorted components before I arrive back home. The white ex-bathroom cabinet contains all the reels of tape, enamelled wire and tins and boxes of fixtures. Behind is a boxed up dual chanel oscilloscope and frequency analyser that I use sometimes. G3RJV sold me the little signal generator (box with thre knobs in centre) and the instructions I found and laminated sit on the shelf next to it. Above the component shelf is a set of little draws simply crammed full of other components. You can see the two Antex soldering irons I use 25W and 18W currently one has a 0.5mm tip other a bit like a 6" nail, as was making up a cabinet from PCB. The pile to the immediate left are the current build projects, I have a few on the go at once. Probably too difficult to pick out but in the centre behind the drill stand is a pile of PCB ready to be driled (just bought some new 0.7mm drill bits) and a number of bags of components from Dans Small Parts (Fixed value inductors, some cenre detent pots and about 250 silver mica capacitors! ), The black dotted white square in the middle, they are black foam spots from local £1 shop, I have these fitted to the bottom of cases. Project documentation, reference books and other notes. It is a shed so everything is boxed up otherwise it would probably become damp, although not had problems with damp to date. Lower Middle shelf, bare PCB, these are mostly the off cuts. Lowest shelf, as yet un allocated or unsorted boxes of components. To the right of this I store my antenna supports and yes the green tube with yellow strip is a 12m racal pump up mast. It gets used probably once or twice each year (in Summer) and holds a 2m and 70cm yagi for VHF contests. Out of the picture further to the right is my collection of telescoping fishing poles 1 x 12m, 2 x10m, 2x 8m, couple 6.7m poles and lots of 5m, 4m and even some 3m. In this pile are all the completed PCB for projects, as soon as I finish working on them, before boxing them up I store them in these with accompanying documents so I can easily start up where I left off. I seem to be using the top as a shelf as those are my boxes of crystals on top under the blue, current build project file. The iron is always plugged in, just not switched on as it is used to transfer PCB masks to boards. There is a dehumidifier sitting behind the file but it is not used currently. It used to be in our previous house and I was worried it might be damp down in the shack, but it isn't. Note the shack is carpeted! That was the old front room carpet before we changed it, don't drop SMD components on it! Following the design from KD1JV and the minaturisation of JN1GLB I have looked at creating a through hole and a SMD version. I have just completed the component layout and tried an initial PCB (double sided). I am not sure all the tracks are wide enough. Here is the film ready for ironing on and etching. I have printed enough for 4 sets of PCB and at least three sets of LPF on the top copper layer. The bottom copper layer is not needed for the LPF. Following on from http://m1kta-qrp.blogspot.com/2009/01/ta7358-tcvr-project.html going through the post Peter/Chris at Jabdog had come through in style and supplied me with the TOKO coils for the GQRP band pass filters (http://www.interalia.plus.com/q_tech1.htm), some sample 10K cans I will experiment with rewinding and all the semi conductors for the project. The postman (post woman actually) just delivered the usual armful of jiffy bags from various electronics suppliers, pcbs and kits and one was from Jan G0BBL. Jan G0BBL had sent me a kit using an Si570 frequency synthesizer chip. 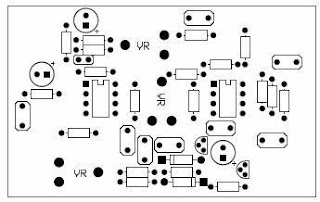 Anyway I had put a yahoo group together to build the qrp2004 tcvr from the qrp2000 design team. The members are now DG8SAQ, PE1NNZ, M0PUB, G8BTR, G0XAR and G0BBL, and there is now a kit operation http://www.sdr-kits.net/ that Jan G0BBL put together. I just bought one of the kits they sell and I will integrate it with an as yet unmade 30m V6.2 Softrock RXTX kit. There is a nice little PCB and all the components for it. I'll follow up with construction details and how it operates with the SDR RXTX kit. 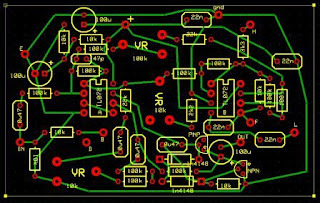 In the weeks just before xmas managed a few days in the shack melting solder and the 80m MKARS SSB tcvr was one such project, I posted about it elsewhere on this blog http://m1kta-qrp.blogspot.com/2008/11/mkars-80m-tcvr.html. These were taken just after completing the first of the component bags as all the discrete C have been fitted. What was nice was the PCB holes actually corresponded to the component sizes. Lots of praise to the MKARS guys for the kitting for this. And a very big hint for kit producers as this makes construction so very much simpler as you do not have to get creative bending 2.5mm C legs as the PCB has 5mm spaced holes or fitting 1/4W R upright as horzontal holes are more suited to 1/8W or short body 1/4W resistors. As you can see I have used one of Doug Hendricks PCB Vice's (when I travel it is part of the /P homebrew bench) and it is great for this sort of construction where you can fit simply loads of components and then tilt the board over and solder one leg of each to hold them in place before reversing the PCB and finishing the job. It makes construction very quick and probably explains why I manage to complete the boards rapidly. The board is fully populated now (the shack is a tad cold right now being just below freezing so no photo just yet) and I am waiting to drill the provided chassis. I may yet make the modifications and put it into a larger case. 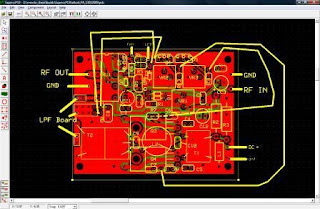 I have created Express PCB components that I will share with those that need them. 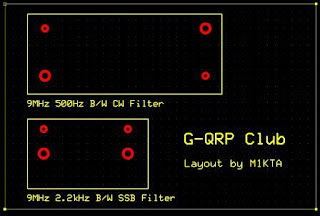 These are the G-QRP SSB and CW filters that you can buy from club sales. Not a major challange but it this means they are available for others to use. Just read the latest issue of PW (Feb 2009) and saw the Notch Filter from Tim Walford. I seem to be a fan of making PCB at the moment and as I know I have some TL072 op amps and the other C and R so knocked up a quick PCB for it and above is the silkscreen for the components. I bought a bag of pots from Dans Small Parts and Kits (through someone else in US) and there is quite a selection, I also have some mini multi turn 10K pot and some centre detent pots so I may adjust the holes to match the available pots. Especially if I fit it to the panel. I will add this to the TA7538 TCVR project. PCB etched and will be drilled once 0.7mm drills are added to the dremel drill press. Bag of the TA7358 SIL IC from Peter at JABDOG, just arrived this morning. A number will go out to others this morning. GQRP/Graham G3MFJ sold me a matching pair of carrier crystals for SSB @ 9MHz +/-1.5kHz at the last GQRP rally so I will shift the IF to 9MHz from 10MHz so I can use them. In addition I may add a second switchable cw/ssb filter so that I have a narrow (CW) and wide (SSB) filter of the same design. Or I might finally find a use for a pair of GQRP club CW and SSB filters. 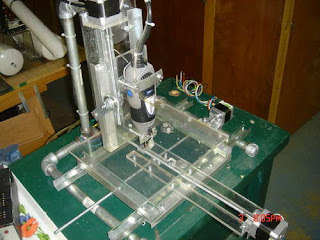 For the VFO I will either use a simple colpitt VFO or roll a new DDS AD9851/PIC controlled or similar based DDS. Although I also have already built an FCC-1 and FCC-2 DDS VFO and Frequency counter that could be employed immediately. Adding an AF based S meter, a cw keyer (KD1JV simple keyer), a battery power meter (see http://m1kta-qrp.blogspot.com/2008/12/kd1jv-and-n7ve-battery-monitors.html), a SMT AF filter (see http://m1kta-qrp.blogspot.com/2008/10/what-to-do-with-some-free-max-74xx.html) and a AD8307 based pwr/vswr meter should round the project off. The project doesn't include a PCB mask but there is a layout but as I will modify a few things as per usual will create a PCB with ExpressPCB and blue Press N'Peel film. Initial layout the board is approximately 8" x 3". Using TOKO coils and I have left the 6 crystal filter on the board for now but I expect I will change the layout to add the GQRP CW and the SSB filters. The transistors on the design layout appear to be TO18 varieties. Those I have are either TO92 or the TO220 (three on left hand side). W8DIZ recently sent me a bag of the IF transformers: 42-IF123-RC KD1JV used so I will have the same as he used rather than the alternatives used in my build. Hopefully the new builds will address the original issues that occured for some with the mixing of the 5.068MHz oscillator signal, the setting an off set, the value of C36 that I found to work and the values for R36 and R37. In addition to the PFR-3 which is a cw 20m/30m and 40m rig I will then have a psk setup for the same bands. Anyway here are the three boards fresh out of the etch tank. I have rubbed away some of the etch mask so I could see the copper tracks underneath. The dark spots are where I used CD pen (resistant the etch) to cover small spots in the mask due to a bit of dust being on the copper when I ironed on the Blue Press N'Peel film. As an experiment the two on the left have a solid ground plane the one of the top right is single sided. Peter at Jabdog has the 6.144MHz crystals for the 30m that will arrive soon enough so will drill the boards and start mounting components. I might start to document the builds as if it were a 'proper' kit build as I believe a few are interested in the design.